Seasons of a Shepherdess: And then there are the pigs.. 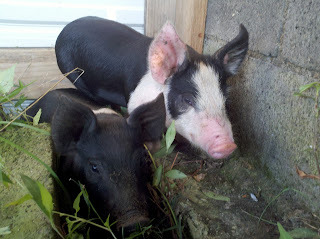 I don't know how long I have wanted a couple of pigs..but it has been at least years of wait. 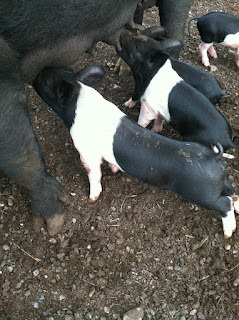 We finally found a couple of Hampshire boys at Twin Gap Farm in Abingdon and our good friends, Pete & Karen picked them up for us. 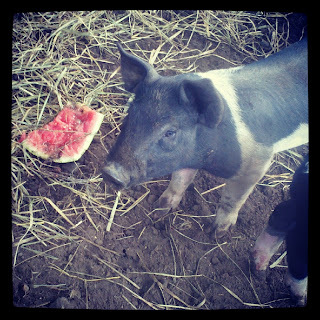 I don't know if I've ever seen a cuter piglet! And their happy snorting sounds are always putting a smile on my face. So far the boys are getting fed all the left over goats milk and whey. On occasion we've also thrown in a little cracked corn and sunflower seeds and of course veggie scraps from the kitchen. They're able to browse but their favorite is rootin'. They are without a doubt the happiest critters I've ever fed and are always ready to eat. What's not to love about that?! We will not be breeding so castrating was necessary and both boys were castrated by hubby and son, Derek here at the farm. There's a short video if you're interested in watching and learning. The video does not show this but the area was scrubbed down with iodine before and after the castration - which is crucial if you plan to do this yourself. I'd also recommend gloves..but hubby does what he likes :) He did wash with iodine before cutting however. Thankfully castration is one of those things that when it's done..it's done and doesn't have to be done again. Relief..for me and the boys! Here's a video of them having breakfast after the castration ordeal. Thankful for the fresh goats milk and that this morning is now behind them.